Earlier this week, President Obama took a cheap shot at the Supreme Court by suggesting that because its members are �unelected� they are somehow without authority to invalidate unconstitutional legislation. This is hardly a sentiment that should come from anyone sworn to uphold the Constitution, much less a public servant who is a lawyer, much less a person who once taught constitutional law at one of the nation�s best law schools. The whole purpose of a life-tenured, unelected, independent judiciary is to be anti-democratic; to preserve life, liberty, and property from the tyranny of the majority. Without such a judiciary, nothing but brute force would protect us from a Congress that recognized no limits on its authority. Suppose that Congress, over the president�s veto, declared Joe Biden insane and removed him from office, or directed that Mrs. Obama lose custody of her children because she sent one of her daughters on a foreign trip without either parent, or that the First Amendment does not apply to those who hate the Chicago Cubs? Wouldn�t the president expect that �an unelected group of people� in black robes would interfere with those actions? Has he actually forgotten that an unelected group of people overturned segregated schools which was the beginning of the end of Jim Crow laws, ordered the government to try or to free people it has arrested, prevented the prosecution of unpopular speech, invalidated the federal regulation of guns near schools, and ordered a president who thought he was above the law to turn over subpoenaed tapes to a federal district court? The Supreme Court firmly established in Marbury v. Madison in 1803 that government behavior that is repugnant to the Constitution is not valid, and it is the duty of the courts to make that determination and to invalidate such behavior. This is called �judicial review:� It is the power of the courts to review the acts of the other branches of the federal government, and to review the laws of the states, and to void them when they exceed the confines of the Constitution. No serious legal scholar has questioned this power in the past 175 years. The president is entitled to his own opinions, just like everyone else is. He is free to argue and to predict that ObamaCare should and will be upheld. But he cannot seriously suggest, with intellectual honesty, that the Court is without lawful authority to invalidate an act of Congress that the Court determines is repugnant to the Constitution. Nor can he, with intellectual honesty, issue veiled threats to the Court. 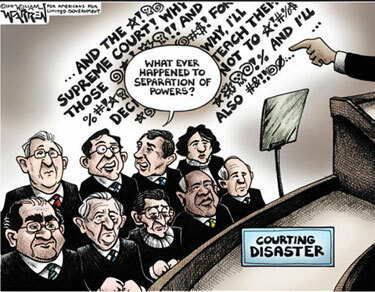 The Court is his equal, as a branch of government. But since 1803, the Court is superior to the president on having the final say as to what the laws and what the Constitution mean; and the president knows that. This Court, which has no army but does have a rich and unbroken tradition of commanding fidelity from the other branches of the government, cannot be intimidated by him. He can criticize it to his heart�s content; but he cannot lay a glove on the Supreme Court.